Gordana Dodig-Crnkovic is Professor in Computer Science at Mälardalen University and Professor in Interaction Design at Chalmers University of Technology. She holds PhD degrees in Physics and Computer Science. 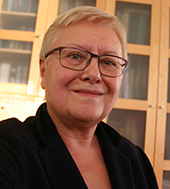 Her current research is in Morphological computing and the connection between computation, information and cognition via interacting agents on different levels of organisation - from physics to biology and cognition, to morphogenetic and biomimetic computational design. More information in the tabs below. In Proceedings of the 2015 European Conference on Software Architecture Workshops (ECSAW '15). ACM, New York, NY, USA. Computability in Europe 2013 (CiE 2013) The Nature Of Computation, Univ. of Milano-Bicocca, 1-5 July 2013. First Workshop on Human Aspects of Software Engineering (HaoSE), OOPSLA Workshop, Orlando, Florida, October 25-29, 2009. There might be more projects where Gordana Dodig Crnkovic participates, but you have to be logged in as a Chalmers employee to see them.